The Flymen Fishing Co. recently launched the Fish-Skull Fly Tester at IFTD and I have a feeling that we'll all be seeing quite a few of these on the custom tier tables at the fly fishing shows come fall and winter with flies of all sorts swimming in the micro current. High quality, crystal-clear, acrylic swim tank with innovative (bi-directional) water flow design. 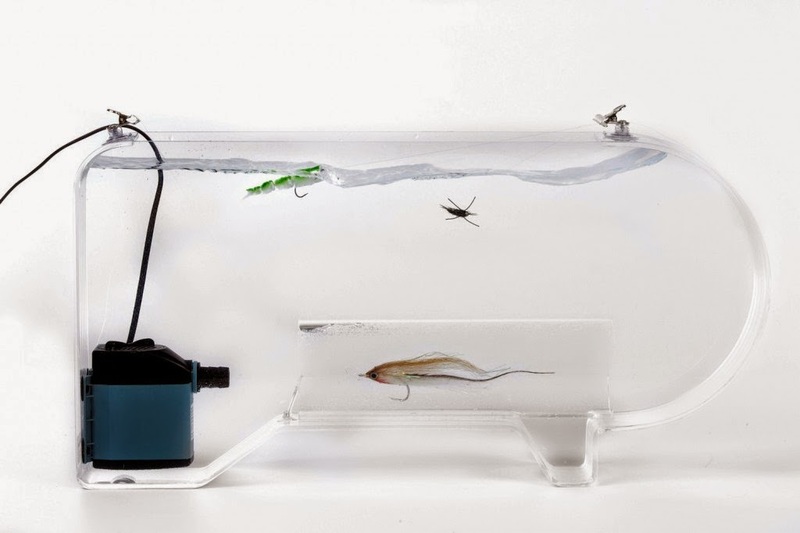 Upper, middle, and lower sections allow you to swim up to 3 different types of flies (streamers, nymphs and surface flies) at the same time. Test streamer flies up to a foot long! The slim line design is light-weight (less 8 lbs. ), portable with a small footprint for any fly tying table or shop counter. Powerful water pump with adjustable speed flow control. Retail ready (boxed and bar coded). Check out the Flymen Fishing Co. website for more information on the Fish-Skull Fly Tester along with other innovative products.